This Flashback Friday looks ahead to Monday, which is Veterans Day. 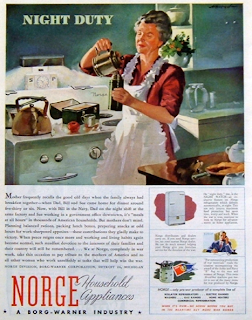 During WW2, having put its household appliance production on furlough, Norge focused on fulfilling the needs of the military. But mindful of the eventual return of its peacetime market, the company continued to connect with those on the home front. This 1943 matriarch—and her hard-working range—kept her family fed at all hours as they worked around the clock in support of the fight against fascism.